The Winnebago Caravans Mossman C, fitted with the X-Country pack, is a family van with rough-road touring intentions. There are two kinds of surprises: the pleasant ones, and the ones that leave a bad taste. It had been, I’m embarrassed to write, a number of years since I had taken a really good look at an offering by Winnebago Caravans. About five or six years ago, these vans were being imported from the US with distinctly American decor and styling. Since 2016, however, the Winnebagos sold on our shores are also built on our shores in one of the country’s largest RV manufacturing facilities, with decor, styling and layouts to suit Australian travellers. Winnebago Australia is a division of Apollo Tourism & Leisure Ltd, the company behind one of the largest RV rental companies in Australasia. It is the result of a special partnership between Apollo and the US RV giant Winnebago Industries. The interior is bright and cheery, filled with natural light. It’s a place you’d want to return after a day sampling the best that the local wineries had to offer. The Mossman C is a family caravan. As such, the layout incorporates three bunks, a separate bathroom, large kitchen, front bedroom for mum and dad, and an amidships offside dinette. By and large, it should suit a family of five nicely. Let’s start at the rear. 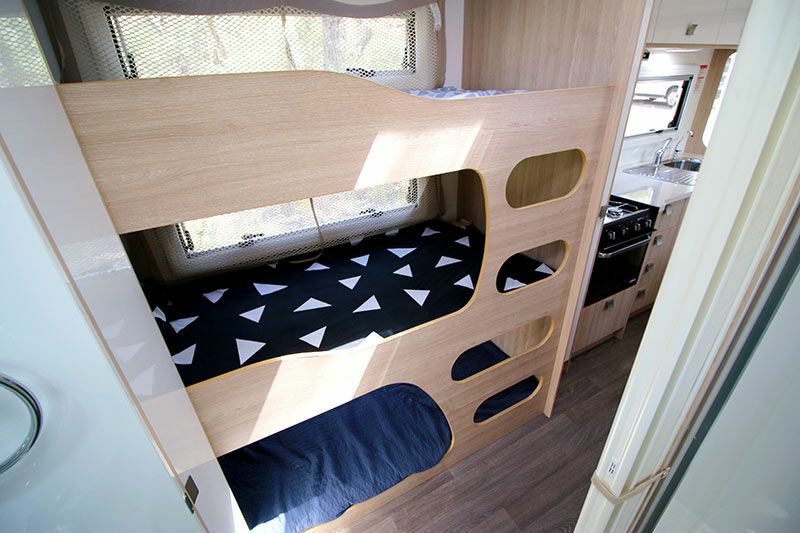 The three bunks look good and comfortable, and I particularly liked that no separate ladder is required. Rather, a series of holes have been routed out of the front part of the framing and neatly edge-banded. A full-height cupboard between the bunks and bathroom offers a number of shelves for the kids’ clothes. If you only need two bunks, you can opt for a fixed upper bunk and a dinette below that converts to a second bunk at bedtime. 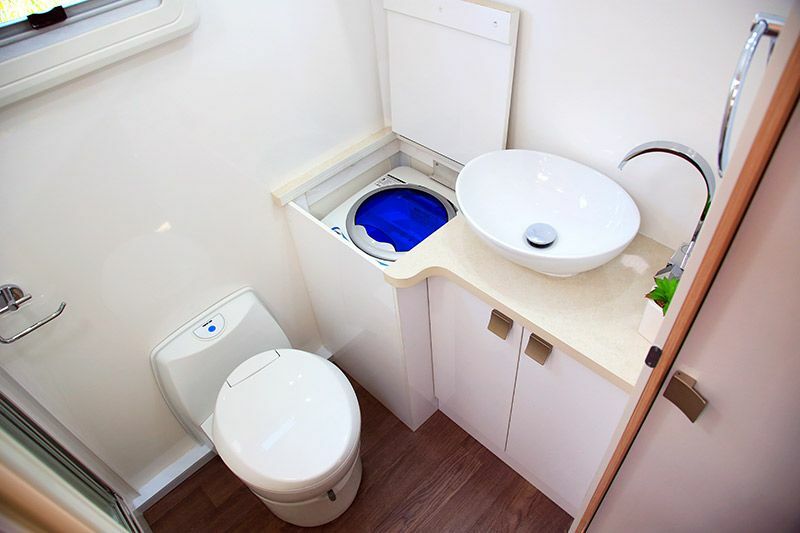 The bathroom offers a vanity with shaving cabinet, a washing machine beneath the vanity bench, a cassette toilet, and a separate shower. I personally liked that the sliding shower door is secured for travel by a black strap (rather than some sort of catch) – it mightn’t be aesthetically elegant, but it’s strong. Finally, the concertina screen that separates the bathroom from the kids’ room seemed a little flimsy – a solid door if possible would be better. The kitchen offers a Thetford Triplex cooktop (two gas burners, one electric burner), griller and oven, a sink with filtered drinking water, a decent amount of storage space, including a large pantry between the kitchen bench and the rear bunks. The dinette, meanwhile, is straightforward but comfortable. While ours came with cafe seating, customers can opt for an L-shaped lounge instead which, for a family of five, might be the better option. A small point: the storage space beneath the dinette lounges has doors that swing outwards, rather than down towards the floor, which should make accessing these areas easier. The front bedroom gets wardrobes either side of the queen-size bed, each with USB charging points, overhead lockers, reading lights and more. The 22in flatscreen TV is mounted on a swivel arm on the offside, at the foot of the bed. Personally, I’d prefer the TV was mounted at either the forward end of the kitchen, or at the rear end of the kitchen. In its current position, anybody seated on the front dinette lounge wouldn’t be able to watch. Other features of the Mossman C include a Fusion Bluetooth-enable marine sound system with two 5in speakers, a 190L three-way fridge, a microwave, and an Ibis 3 reverse-cycle air-conditioner. Overall, the interior is very appealing. It really felt like home to me. The Winnebago Mossman C is built on a hot-dipped-galvanised box section chassis. The one-piece walls and roof are a gel-coat-finished fibreglass sandwich panel incorporating a high-density foam core. The walls sit on top of extruded aluminium running the length of the van, with more aluminium extrusion ‘locking’ the side and front/roof/rear panel together. It certainly appears to be sturdy. As standard, the Mossman C comes with Al-Ko IRS suspension; however, the ‘X-Country’ in the van’s name refers to the fact it has been fitted out with some gear for rough-road touring. This includes Al-Ko Enduro Cross Country suspension and 3.5-tonne offroad pin coupling, a second 150W solar panel (providing a total of 300W), and a 1000W inverter. A word on weights. This van has a Tare of 2305kg and an ATM of 2950kg, giving it a payload capacity of 645kg. Now, given the stated GTM of 2762kg, you’ll need to ensure you have at least 188kg (an increase of 58kg over the unladen ball weight) on the towball to stay within GTM, should you load right up to the allowable 2950kg. Having said that, that shouldn’t be hard to achieve, considering you’ll have potentially 18kg of gas in the drawbar-mounted cylinders, water in the tanks, load in the front tunnel boot, etc. For towing stability, every caravan needs a certain amount of towball weight, and the ‘magic number’ varies from one van and vehicle combo to the next. There does appear to be plenty of scope here to find it, though Winnebago hasn’t specified a maximum ball weight. Further, there’s a 457kg difference between Tare and GTM in this van anyway, which itself is a reasonable amount. But like with all vans, it pays to be aware of the issues and load with caution. External features of this van include a full-length roll-out awning and awning light, a rear-mounted spare wheel, and a picnic table. There’s also a couple of external speakers and a 12V charging point. The house battery, a BMPRO Battery Plus 35 charger, Camec Break Away system, and the inverter, are kept on the offside in the tunnel boot. I loved the catches for holding open each tunnel boot door – it’s the small things that make the difference. In short, stepping inside the Mossman C X-Country was almost like a breath of fresh air. Its layout is welcoming and very liveable for a family of five. Current model Winnebago caravans (including the one reviewed) do not have a “gal-lined tunnel-boot” as stated in your review. The boot floor is the same vinyl covered composite as the floor in the rest of the van and the walls and “ceiling” are laminated plywood as used in the van’s furniture – your photo actually shows this. Well spotted, Tony, and of course you are right. We’ve updated the review accordingly.